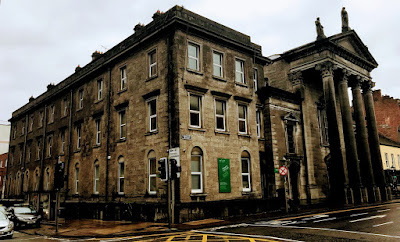 Earlier this week, before I went in search of the earlier Franciscan sites in Limerick, I visited the Limerick City Museum, housed in the former Franciscan Friary in Henry Street. The Franciscan Church next door has been closed since for ten years, and at present it is closed to the public. 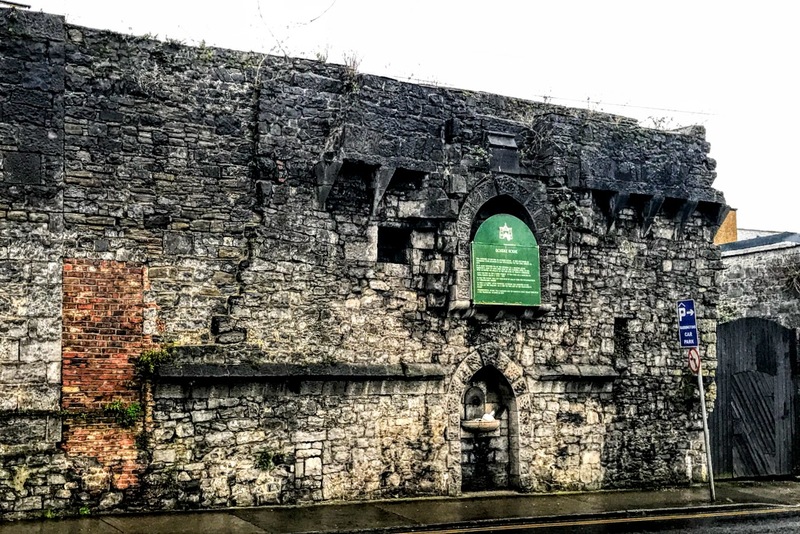 The first Franciscan friary in Limerick is said to have been founded in Limerick in the mid-13th century, and a sign on a house in Gaol Street identifies the site of the former Franciscan Friary or Abbey. After the Reformation, some Franciscan friars remained in Limerick, and four friars re-established a friary in 1615. They were expelled in 1651, but recovered their chapel in 1687 and rented the site of their old abbey until the 1690s, when they were expelled yet again. In the 18th century, they moved around between Burke House, near the corner of Nicholas Street and Athlunkard Street, a site in Newgate Lane, and then in Bank Place, until they acquired a site on Henry Street in 1824. There, a new church was built in 1826. and the Franciscans moved to the new friary in 1827 when the new church opened. However, both the church and the friary were condemned by the Franciscan Visitor General in 1873. The foundation stone for a new church was laid in 1876, and the church was dedicated by Bishop Gregory Butler of Limerick to the Immaculate Conception of the Blessed Virgin Mary on 18 May 1876. The architect was the Limerick-born architect and civil engineer William Edward Corbett (1824-1904) and the builders were McCarthy and Guerin. It is said the labourers who were working on Wellesley Bridge (now Sarsfield Bridge) contributed generously towards the building of the church. William Edward Corbett was born in Limerick on 19 April 1824, the son of Patrick Corbett. 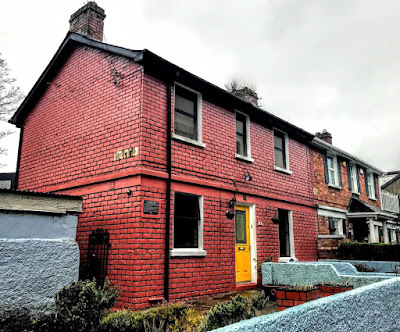 He was the architect and borough surveyor of Limerick City from 1854 until 1899, and lived at Patrick Street (1856), Glentworth Street (1863-1898) and Lansdowne Road, until he died on 1 February 1904 at the age of 79. His other works in Limerick city and county include the former Jesuit church on the Crescent, Saint Joseph’s Roman Catholic Church in Castleconnell, Saint Joseph’s Church in Limerick, and the Tait Memorial Clock in Baker Place. Earlier, Corbett had worked with Hardwick on Adare Manor and at Mount Saint Alphonsus. The Franciscan Church was completed in 1886. However, it was only partially finished and work on the final extension began in 1928. The church was extended and enlarged in 1930 under the supervision of the architects AE Jones and SS Kelly. The church was consecrated by Bishop David Keane of Limerick on 7 December 1931, the eve of the Feast of the Immaculate Conception. The apse of the church was not completed until 1942 when the lands behind the church were bought. This church is a formidable exercise in classical church architecture, and the façade consists of an imposing entrance, a classical pediment and a portico of four towering Corinthian capped limestone pillars. 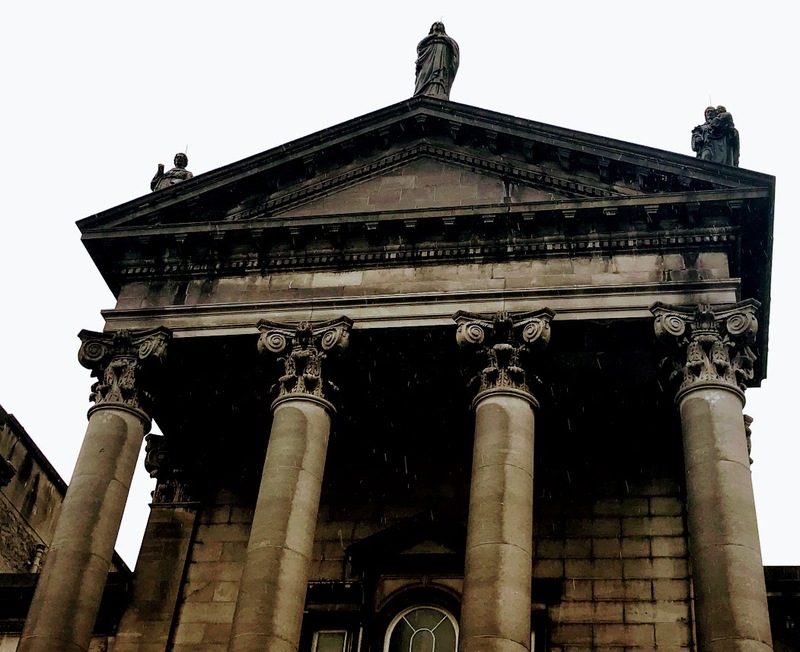 The vertical emphasis of the imposing tetrastyle Corinthian pedimented portico recalls Saint Audoen’s Roman Catholic Church in Dublin. 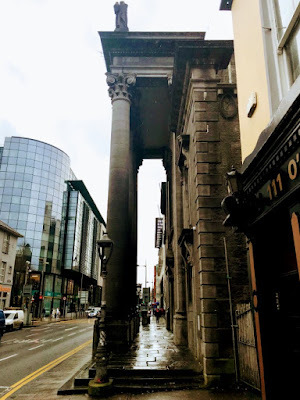 The way this portico reaches over the public pavement draws comparisons with the porticoes of the Bank of Ireland on College Green and the GPO on O’Connell Street in Dublin. It was probably designed like this to emphasise its presence on this relatively narrow streetscape. The figurative sculptures on top of the pediment are of Saint Francis, the Virgin Mary and Saint Anthony. The church remains closed, and I was unable to gain access this week, but it is said the interior was inspired by the Basilica of Santa Maria Maggiore in Rome. The square-headed window openings to the aisle bays were adorned with triangular pediments. Large granite pillars support the nave, and the clerestory consists of round-headed windows in sets of three which are also supported by granite pillars. I am told words of a Latin hymn the Franciscans used to sing could be seen around the walls of the clerestory. The church decoration was the work of J Hodkinson & Sons of Henry Street, Limerick. At the back of the left aisle of the church there were stained glass windows of Saint Bernardine of Siena, Saint Louis of France and Saint Elizabeth of Hungary. The apse was tiled with coloured marbles and mosaics carried out in Venice and Pietra Santa. The painted ceiling depicted Franciscan saints. The former friary next door is a four-bay, three-storey building, built in 1876-1886, but not finished until 1929, with a ten-bay, three-storey elevation facing Bedford Row. The friars left Henry Street on 13 June 2008. They left taking nothing with them but the Stations of the Cross. The church and friary were handed over to the newly formed Saint Bonaventure Trust chaired by the Bishop of Limerick. In 2011, the church was the venue for an exhibition of work by local art students, when it opened to the public for the first time since the friars left. In 2014, the church and the friary were leased to the Limerick City and County Councils to become the premises of the Limerick Civic Museum and Archives. Tomorrow: Saint Joseph’s Church, Limerick. Earlier this week, I visited the Limerick City Museum, housed in the former Franciscan Friary in Henry Street. The Franciscan Church next door has been closed since for ten years, and at present is closed to the public. 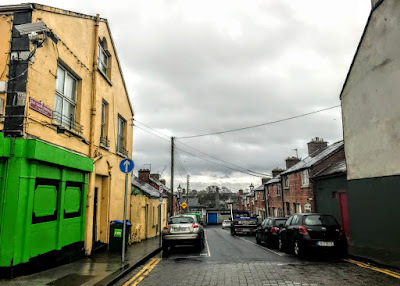 So, after my visit to the museum this week, I went in search of the earlier Franciscan sites in Limerick, who may have first arrived in Limerick in the 1240s. Their first friary is said to have been founded in Limerick within the next few decades. Although nothing remains on the site of their mediaeval friary near Sir Harry’s Mall, the site is parked with a plaque on the façade of a house in Goal Lane, off Mary Street. 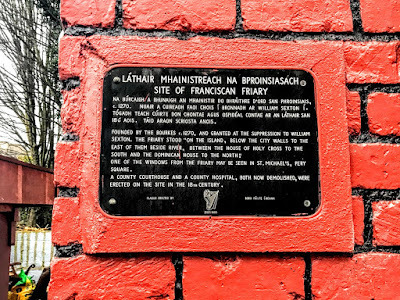 Some historians say the friary was founded by Donogh Cairbreach O’Brien before 1241, others say was founded by William de Burgho, the son-in-law of Donald O’Brien, King of Thomond, before 1287, or in 1350 by Mary FitzGerald, Countess of Desmond. De Burgho was the son-in-law of Dermot O’Brien. The Limerick historian Thomas Johnson Westropp argues 1241 is the correct date is 1241, and that the later dates refer to times when the original buildings were restored. The friary stood in ‘English Town,’ between Sir Harry’s Mall and Athlunkard Street, on Goal Lane off Mary Street. It was also known as the Franciscan Abbey and gave the name Abbey to the surrounding area. There was also an oratory dedicated to Saint Anthony on the island in what is now called Saint Mary’s Parish. The Franciscan friars in Limerick did not adopt the Observant reforms until 1534. At the Reformation, like most religious orders in Ireland, the Franciscans were suppressed between 1539 and 1548, and most of their buildings were demolished. Their abbey in Limerick was granted to Alderman Edmond Sexton in 1543, and this grant later confirmed by King James I. Some Franciscans remained in the city, and a community of four friars re-established a formal residence in 1615. In time, years three chalices were given to the order – the Farrell Chalice (1619), the Creagh Chalice (1627) and the Rice Chalice (1626). The Creagh Chalice came into the possession of the Bishops of Killaloe, while the other chalices continued in use by the Friars in the centuries the followed. During the Confederate war, this community took possession of their house in 1642. On 14 June 1646, the standards captured at the Battle of Benburb were displayed in their friary chapel before being deposited in Saint Mary’s Cathedral. On 17 July 1651, the Virgin Mary reputedly appeared over Saint Mary’s Cathedral with Saint Francis and Saint Dominic as well as other friars from the two orders. Local lore said the vision in the sky then moved onto the Dominican Priory and finally to the Franciscan church. But the Franciscans were expelled from the city in October 1651. However, after the end of the Cromwellian era they returned and recovered possession of their little chapel in 1687, when they rented the site of their old abbey from the Revd Stacpole Pery, a descendant of Edmond Sexton and father of both Edmund Pery, 1st Viscount Pery, and William Pery (1721-1794), 1st Baron Glentworth and successively Bishop of Killala (1781-1784) and Bishop of Limerick (1784-1794). It is believed the Franciscans remained at this site until 1691. But by 1698, they had been expelled with all other religious orders from Limerick city. In the 18th century, a country court house and a county hospital were erected on the site. But these have been long demolished, and the site is now occupied by two houses. By 1732, four friars were living in Bourke House near the corner of Nicholas Street and Athlunkard Street. This also became known as the Castle Friary, and there Father James White erected a small chapel in 1745. By 1766, two friars were also doing parish work in the chapels of Saint Nicholas and Saint Mary. In 1782, the Franciscans leased a site in Newgate Lane, behind Saint Mary’s Cathedral. On Christmas Day, the community opened a small chapel at this small friary. This chapel remained in use until 1822 when the lease expired and the landlord, Major George P Drew, told the Franciscans that he was not renewing the lease. The Franciscans took the church fittings with them and the building was destroyed. A window from this chapel is now in Kilrush church ruin on the North Circular Road in Limerick. The Franciscans then moved to Bank Place, where they remained until they moved to Henry Street in 1827. They acquired a site on Henry Street in 1824, a new church was built in 1826 and they moved to the new friary in 1827. 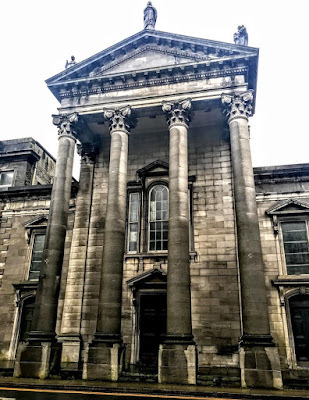 Next: The Franciscan Church on Henry Street, Limerick.